The Top Secret Area is a hidden area filled with power-ups able for use by Mario and Luigi during the events of Super Mario World. The area is situated behind the Donut Ghost House, and is unlocked by finding the secret exit in that Ghost House. It functions similar to the Toad Houses, and leaving the level will not end the player's turn. The level consists of a single area with five ? Blocks. The two ? 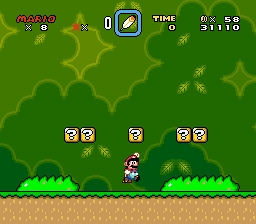 Blocks on the left hold Fire Flowers, the two on the right Cape Feathers (when Small Mario hits the ? Blocks, he will get a Super Mushroom first). A Yoshi Egg will appear when the center ? Block is hit (a 1-Up Mushroom appears if the player already has Yoshi). It contains no enemies, and can be accessed an infinite amount of times, allowing Mario and Luigi to acquire the maximum amount of extra lives. In the SNES version, the area has no Time Limit. In the GBA remake, the area has a time limit of 200 counts. All Yoshi colors are available in the remake, depending on the specific power-up Mario or Luigi has. The player can leave the area through either the left or the right exits. The level's location icon changes in the two versions. The SNES version has a yellow space, whereas the GBA remake has a smiling, blushing green hill. This page was last edited on April 20, 2019, at 12:47.